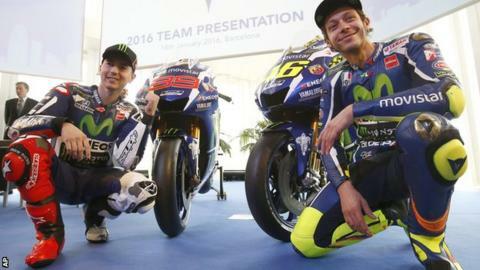 Nine-time Moto GP world champion Valentino Rossi says he will finish his career at Yamaha. The Italian, 36, was pipped to the 2015 title by team-mate Jorge Lorenzo and insisted he could compete for honours in 2016 and beyond. "I would like to race also after 2016. In any case, I will end my career with Yamaha," he said. "I want to try to be at the level I've had for the past two years. Then we'll see whether I can fight for the title." He also called for "respect" from Lorenzo, with whom he has had a fractious relationship at Yamaha. "I've always respected Jorge Lorenzo - he's respected me a little less," said Rossi, at the launch of Yamaha's new M1 bike on Monday. "Let's hope the respect will be mutual this season." Lorenzo secured the 2015 Moto GP crown by just five points after Rossi was forced to start from the back of the grid in the final race of the season in Valencia, Spain. It was a punishment for his collision with Spaniard Marc Marquez in the previous race in Malaysia. Rossi needed to finish second in Valencia to take his first title since 2009 but could only manage fourth. Lorenzo played down any bad feeling between the team-mates. "I hope next season finishes like last season, in the sense that our rivals will be behind us," said the Spaniard, 28. "I hope to win again or, if not, Valentino. I don't have problems with anyone, neither with Rossi, Marquez or [Dani] Pedrosa." The 2016 Moto GP season begins on 20 March with a night race at Qatar's Losail International Circuit.